We want to support you, your colleagues, and your organization to gain all the benefits of riding. As you know, biking has so many benefits! From being healthier and happier, to being more energized and productive, to taking fewer sick days and being more sustainable. AND, this year you can directly challenge another organization and you will compete directly with them on a dedicated leaderboard. You can also complete on special industry leaderboards. Your organization can choose to take part in a 'Workplace Bike Challenge' during the National Bike Challenge. There are two Workplace Challenges during the NBC - May and another in September - you can take part in one or both. Organizations and their departments will compete against others of the same size (so it's a level playing field). Each individual, organization and department will earn points as pictured below. 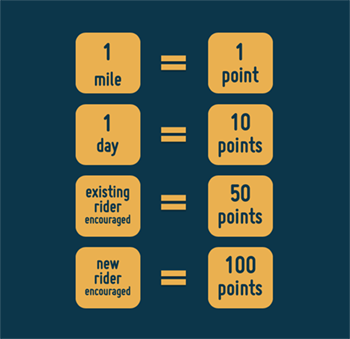 The more points you earn by riding and by encouraging others to ride too, the higher up the leaderboard your organization and department team will go. There will be great prizes that you and your colleagues can win. Marketing and promotion materials provided. Team points are the sum of all of the individual team members’ points. How do encourager points work? For a full details: See here! Ride a bike anywhere, anytime, during the month-long Challenge. Recruit your colleagues and friends to ride and join in too. Go into the prize drawing! Businesses have much to gain be encouraging and supporting you and your colleagues to ride. That’s why we want to work with your colleagues in HR, sustainability, staff engagement, and employee transportation to provide a comprehensive program of encouragement, including providing functionality to reward and incentivise people you and your colleagues to ride. Naturally, there is a small fee to cover our staff time to support you and your colleagues to ride and participate in the Challenge. The ROI is massive for your company due to all the benefits it will bring and the cost of participation being very reasonable. Learn more about Love to Ride for Business here - and the features and benefits you get. Let's get more of your colleagues enjoying the benefits of riding!